These refer to inflatable airtracksthat can absorb and withstand punches, elbows, jumps, hard tramples, or any other contact with one of the body parts. 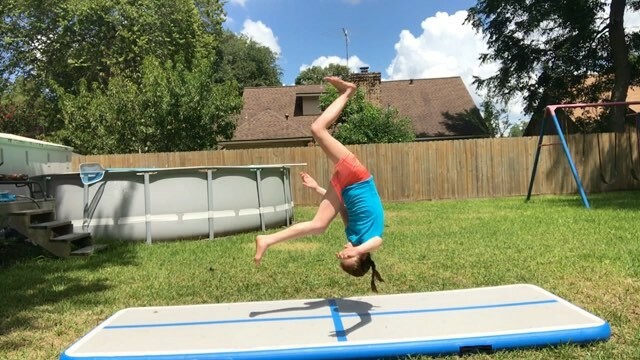 All of these result from performing activities such as martial arts, gymnastics, free-running, cheerleading, jumping, somersaulting, and demonstrating, among others. Most of these activities take place during training or competitions, which can either be indoor or outdoor at school, beach, carnival, in the gym, festival, sports galas, shows and many more. This is so because they (airtracks) are portable and easy to set up for immediate use. All in all, airtracks can be used almost anywhere so long as there is flat space. Airtracks can serve their purposes because of their range of measurements that suit everyone. It is even possible to customize them into length, width, thickness, and color of your choice depending on your height and weight.However, they are usually manufactured with a length of up to 12 meters, a width of up to 4 meters, and thickness of up to 300mm. These measurements guarantee safety due to the softness, wide area for one not to fall off, and thickness to cushion the user on landing. This implies that the user has extremely limited or no chances of getting hurt or injured when using airtracks. Inflatable airtracks are manufactured for both children and adults including professional athletes. The objectives can be different as to some it is all about having fun, exercising the body, and relaxing while to others it is a more serious and professional career practice. That aside; it is recommended for children to play in the presence of their parent or guardian, whose role is to watch over them in the name of ensuring their safety. It is also very important to ask for the user manual on purchasing the airtrack. This is because it contains all the tips and safety precautions that will help you have hurt-less and fun practice. All airtrack mats and other airtrack products are basically used for sports training. They are usually associated with activities like martial arts, gymnastics, pre-school gymnastics, free-running, trampling, somersaulting, physiotherapy, jumping and bouncing. These activities are mostly executed in gyms, recreation centers, schools, sports centers and living rooms at home. This implies that airtrack products can be used both indoors and outdoors. The most prominent merit of these products is the freedom to be used by young kids, girls, boys, teens, men, women and even elders. The main caution is to look out for the children while they play. It is even recommended to help the little kids play to prevent them from falling off the mats. 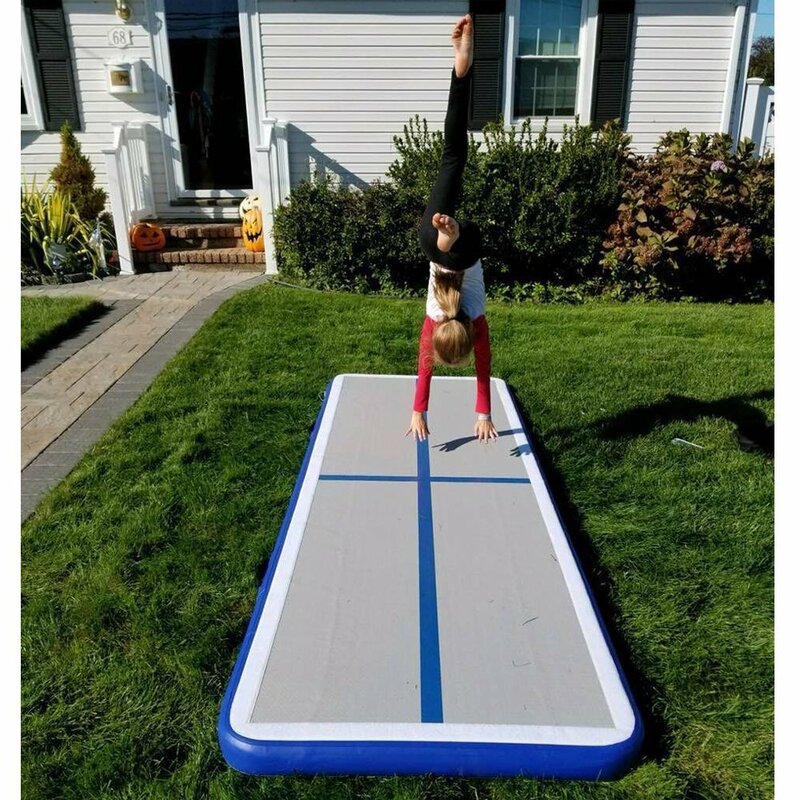 First of all, it is recommended to place the airtrack mat on a well-leveled surface to keep them straight and stretched. It is also recommended to put a clean sheet or cloth on the ground before setting up the mat. Secondly, check and inflate the airtrack mat by using the approved blower or air pump. The inflated air should not exceed the recommended air that is supposed to be accommodated by the mat. This can be measured by using a manometer. Next is to remove your footwear and any other objects like jewelry, keys, belts, and watches that might harm the mat or hurt you on landing. When using airtrack products, you are guaranteed to work out the body and have fun. And when you work out regularly; you are guaranteed to be fit, physically strong, mentally active and super healthy. After using the airtrack mat/product, it is essential to be very careful with its storage. But first, locate the valve on the mat and deflate it with care. After that, fold it from both ends, equally in shape. You can then place it inside a bag or any other equipment or anywhere safe. You can refer to the user guide for the detailed safety tips. For more information, do not hesitate to contact us on this website. These are inflatables used for training and having a good time. They are currently on high demand because of their softness, smoothness, and thickness. They are also springy which makes them more comfortable and fun to use, as they are exceedingly limited from causing injuries to the body. They are widely used by both children and adults, from amateurs to professional athletes. They are also common in schools where kids get to practice gymnastics, cheerleading, trampling, jumping and bouncing, among others. On the other hand, professional athletes and other users commonly use airtrack inflatables in gyms, basketball courts, recreation centers, sports centers, and entertainment centers. 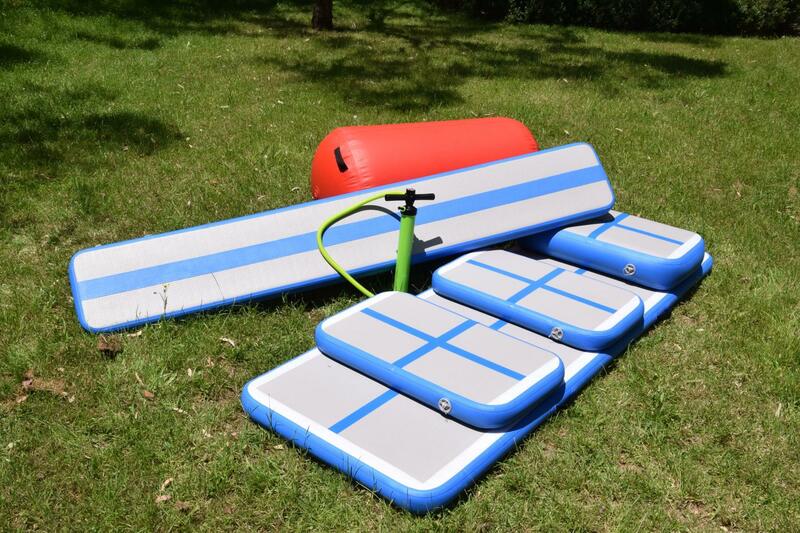 These airtrack inflatables are relatively easy to set up and use. 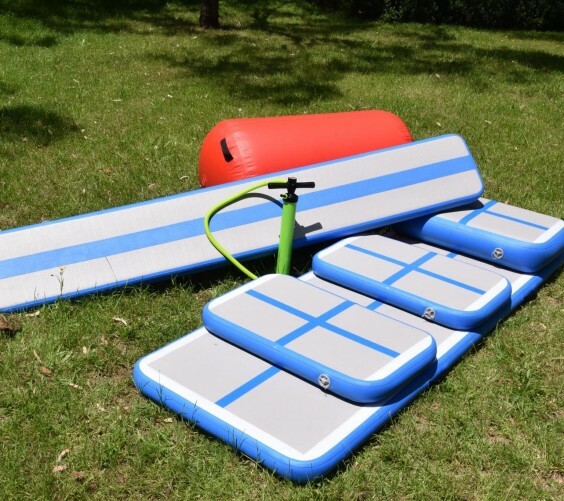 This is even easier when using a user manual which is purchased along with the inflatable. 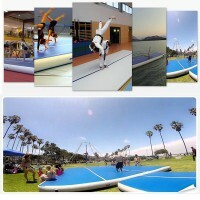 Setup includes inflation which takes approximately 10 seconds to 5 minutes, depending on the size of the mat/airtrack. Also, depending on the activity you intend to perform, some activities require more than one type of airtrack. This sometimes calls for combining two airtracks to form a complete training kit. For example, your training may require extra space or thickness, which would call for connecting two mats proportional in width and length, by using Velcro connections. Dissimilar to other inflatable equipment, airtrack mats, and other airtracks can be used from anywhere. This is because they are relatively light in weight and portable, thus easy to transport from one place to another. Besides the usual training centers like gyms, it is easy to improvise and set up your backyard or living room into a personal gym or training center. Airtracks are available in different lengths, heights, widths, thickness, and colors. You can contact us on this website with specifications of your choice, to purchase them (airtracks) for home use or rental business. Airtracks are the way to go given that they significantly improve our health.